Diversified Industrial Service Company (DISCO), Inc. has been around since 1968. We offer a wide variety of services, including natural gas compressor cylinder repair, and have managed to retain the services of employees with a combined experience of 190 years. 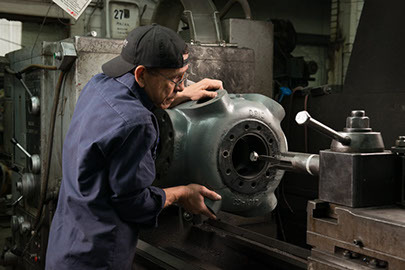 We are a one stop shop for all things related to natural gas compression (compressor cylinders, pistons, rods, valves, crossheads, connecting rods, etc.). If you are looking for professionals to rebuild your equipment as well as to manufacture replacement parts for them, Disco is the place to go. Most importantly, we’ve been doing this a long time. G & G Fishing services was started in 1946 to service the drilling industry, which it did up until 1968 when DISCO was started. When the drilling slowed down, the compression started up, and that’s where we’ve been ever since. You can always be sure of getting quality service from us when we are servicing your natural gas compressor cylinders and their components. If you are looking for precision machining, we can manufacture all types of pistons, rods, sheaves and bushings that you need. We have expert machinists that have access to state of the art machinery in order to manufacture any replacement parts you need. We offer two different processes for repairing your compressor cylinders, a metalizing process and a relining process. What qualifies us to repair your natural gas compressor cylinders? There are various differences between us and our competitors when it comes to natural gas compressor cylinder repair. The first is the quality of services you get from us. We understand the nature of your business and how “scheduled maintenance” can turn into “We need it yesterday!” We have multiple drivers on standby ready to be dispatched to your location at any time, day or night. We understand that there are only a few metalizing processes out there and many machine shops may use the same ones that we do. However, the way that we have continued to grow for the last 40 years is by simply delivering when you need it. The second is the expertise of the people that work for Disco. Our company has gathered a large team of incredible people who can ensure that you get top notch services. We have prided ourselves over the years of taking great care of our employees, so turnover in our shops has never been an issue. We also have a standing inventory of a large number of common parts and are capable of manufacturing a lot of aftermarket replacement parts for compressors.